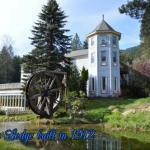 This Historic Ashford Lodge features a restaurant fireplace and free Wi-Fi. The entrance to Mt. Rainer National Park is 10 minutesâ?? walk away. Each cottage provides a full kitchen and boutique spa toiletries. Cable TV and wood flooring is provided. A full kitchen is also offered in cottages at Alexander's Lodge. Each of the units in the main building is unique and some rooms offer cable TV. Fresh trout caught from the properties local pond homemade breads soups and pie are some of the specialties served at Alexander's Lodge. An extensive wine and micro-brew beer list is offered. A spacious lounge and a spa with massage services is offered. Nearby nature trails lead to Gifford Pinchot National Forest. Local artisan gifts are featured in the gift shop onsite. Pioneer Farm Museum is 40 minutesâ?? drive away. Mt. Rainier Gondola is 100 km away from Alexander's Lodge.